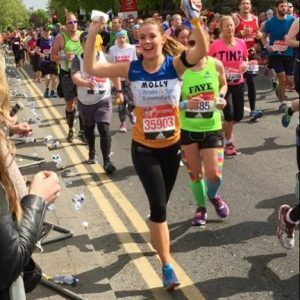 Join our team running the iconic London Marathon and help us support more people than ever before! The team for this event is now full. Please check back here for next year's application. Thank you! "The organisation from start to finish has been first class! It’s been a real joy to have been part of this year VM London Marathon running team." A huge cheer from us at our two on course cheer points! "I was really appreciative of the support I received from Andrew and The Brain and Spine Foundation. It was important for me to feel a part of a team, pulling for a cause that is very important to me. Andrew and the Brain and Spine Foundation went out of their way to make sure that my experience was a memorable one!" How do I join #teambrainandspine? Take your time to fill out the form below. Do you have your own place in the London Marathon? If you have been lucky enough to secure your own place in the London Marathon, and would like to run in aid of the Brain & Spine Foundation please call 020 3096 7879 to connect with our team. You will still have access to all the benefits of being part of #teambrainandspine as listed above! Got more questions? Get in touch! If you have questions about our London Marathon team please contact Alice on 020 3096 7879 or send an email to events@brainandspine.org.uk.